:Take the time this Christmas season to connect with your kids in a meaningful way while enjoying a very special Advent in Odyssey! Prepare for Christmas with 24 Adventures in Odyssey episodes?designed to help your family understand Christmas in a new and meaningful way. Use in conjunction with the Adventures in Odyssey Advent Calendar or on its own. This Christmas, start a new family tradition and have fun with your friends from Adventures in Odyssey. 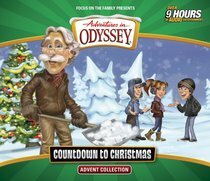 About "Countdown to Christmas Advent Collection (Adventures In Odyssey Audio Series)"
Order now to secure your copy when our stock arrives. 0 Available. Expected to ship May 2019. Discover Focus on the Family's best-selling Adventures in Odyssey audio series for primary-aged listeners with this great-value sampler! When Connie and Eugene take a voyage in the Imagination Station, they find themselves in first-century Israel at the time of Jesus' birth. There they encounter the Magi, a Roman soldier who works for King Herod, and Mary and Joseph.